With my debut romantic suspense novel releasing next week, you can bet I’ve been spending a lot of time in revisions over the last few months. Everyone has their own process for handling edits in Scrivener, but since some of you have asked, here’s mine. I make all of my changes directly in Scrivener. I prefer to work with two monitors when I’m referring to comments from an editor, beta reader, or proofreader. If you can beg, borrow, or buy a second monitor, I can’t recommend it enough (unless you have a mammoth one already, in which case you can probably just view both windows side by side). Annotations are a pre-revision tool for me. I use them to make notes to myself about areas that need something (e.g. more research, a conversation I’m not ready to write), usually while I’m writing and don’t know what to put in a specific spot yet. I also use them to make notes where I’m not 100% happy with what I have, but haven’t figured out how to make better (e.g. catchier opening line, better chapter-ending hook, snappier dialogue). When I’m ready to deal with all of my annotations, I can just go to Edit—>Find—>Find By Formatting and step through them. Or, I handle them as I'm doing a read-through of the manuscript. Comments work in a similar way. If you prefer to be able to see your notes in the sidebar, and don’t want them embedded within the text, comments might be a better option for you. Now, before I actually address an annotation—or a note from my beta reader or editor—I (try hard to remember to) take a snapshot of the document I’m about to edit. If you’re worried about forgetting, you can select all of the documents you expect to work on that day and use the Take Snapshot command to capture all of them. The snapshot for a document is viewable in the Inspector. Just click the camera icon at the bottom. When I’m in the early revision stages—essentially before sending to my editor—I don’t really bother to keep track of my editing passes, though you certainly can. If you’re very methodical about it, making one pass for emotion, one for setting, and so on, you might want to use my post-editor method for all of your revisions, using additional label values. Once I have my editor’s comments in hand, I want to make sure I know which documents I’ve finished and which ones still need work. I accomplish this by changing the use of the Label field from POV (what I generally track when I’m writing fiction) to Edit Stage (I didn’t actually rename it or get rid of the POV values, but you could). Then I create labels that apply to each of the rounds I intend to make. In the case of BLIND FURY, I had three values: one for each of the editorial rounds I went through, as well as one to show that I had completed the proofreader’s fixes. I always have icon colors turned on (View—>Use Label Color In—>Icons) so I can see the editing status of each chapter and document at a glance. I like to work in Full Screen Composition mode, so to start, I select my first document, enter full screen, and click the Inspector button to view it and moved it to the corner (in Windows it looks more like the standard inspector). 1. Make edits to the document. 2. Change the label value in the Inspector to show that the document has been edited. 3. 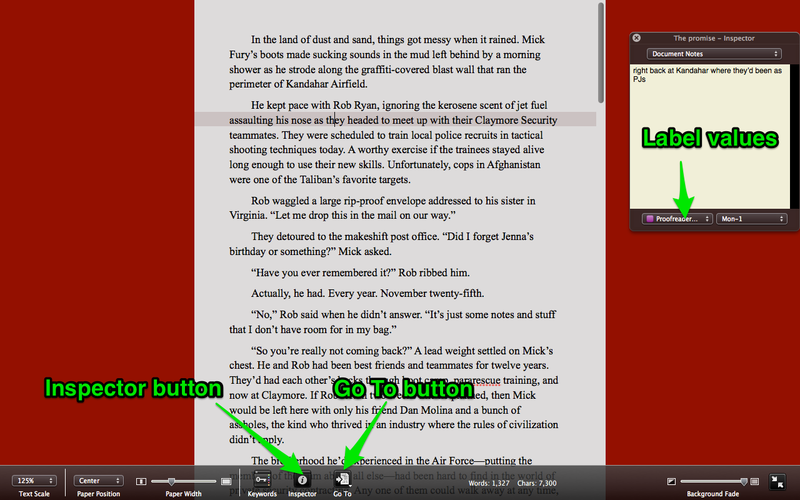 Use the Go To button to navigate to the next document I want to edit. This process means I don’t have to exit full screen composition mode every time I want to label the document and switch to a new one. Any questions? Want to share your method? Oh… Thank you for this! I’m “pocketing” it for future use because I need this badly. Absolutely, Sandy! I’m glad you found it helpful. Good luck! I really appreciated this Gwen, it’s gonna make my life so much easier! Gwen, thanks for such a helpful post. Especially for your tips on using Annotations & Comments. My DH is my first editor and uses Nisus to write his edits/comments. I was going a little nutty switching back and forth between the two. Then—after much longer than I will admit :-(—it dawned on me I could copy his comments and paste them into Notes. So now I have the editor open and, floating to the left of it, Notes. As I address each comment, I use strike-through to indicate I’ve finished. Works like a dream! Ugh. Just lost some research links while trying to organize files–should have taken a Snapshot first. Next time. Thanks for this helpful post! Oh no, Kathryn. Have you tried using Project References instead? I love them for web pages I reference often but don’t want to import. Good stuff, Gwen, but more than anything, I wanted to say how nice the blog looks! I love the clean header, background, fonts, and the colors you chose. Thanks for the info, Gwen. As always, it seems to fit right in with whatever I’m currently slogging through with my writing and Scrivener. And, as Ferd pointed out, your new blog look is very nice! Have a great weekend. CortlandWriter: Glad the info was timely for you. 🙂 And thanks! Thanks for all your posts on Scrivener. I’m finding them incredibly helpful in addition to your book on Scrivener, which has saved me immense frustration multiple times. I do have a question: is it possible to search all snapshots? I had the experience recently of needing to find something from an old version but not remembering which document it had been in. I couldn’t find a way to search all snapshots so I had to look through each individually. It was maddening so I’ve started duplicating my Draft folder before making big revisions, but as you mentioned it does make the binder a little cluttered. swalkerc: Unfortunately, there isn’t a way to search the snapshots, though I could see how that would be useful. Maybe you could add it to the wish list on the Scrivener forum. Glad you’re finding the posts helpful otherwise. Good luck with your writing! That’s a great guide. I’m just finishing revisions on my first book. I did all of my revisions in Scrivener in a way very similar to what you’ve described. I’ve absolutely fallen in love with Scrivener. Unfortunately, my editor insisted on working in MS Word for the revisions I did with him. I was reluctant but agreed. Wow… If there’s one thing that Word still has over Scrivener, it’s the Change Tracking features. My editor went in and made changes to my document and then sent it back to me. All I had to do was step through the changes one by one and approve, reject, or modify his alterations. The entire process saved me a ton of time and heavy-lifting. Otherwise, I would’ve had to go through his notes and make the changes to my file manually and I would still be working on it. I’ll continue to do all of my writing in Scrivener for dozens of reasons. But I’ve come to realize that, if there’s one feature that L&L needs to add to the application it’s Word like Change Tracking. I can do without M$ products as a whole, but they really nailed it when it comes to that particular feature set! I’m with on the 2nd monitor, one hundred percent! That makes life so much easier in so many situations. I think that some people find the 2nd screen intimidating. But for anyone who gives it a chance it quickly become a power-tool! Yep, can’t live without mine for revisions, working on class lessons, or anything where I need to flip back and forth a lot. I got hooked when I was doing a lot of software testing. Make changes to the code on one screen, run the new version on the other. So much faster! I’ll never go back. Once you try a three-monitor system…you’ll NEVER go back. Really. My desktop setup is: left and right ones are both 24 inch monitors set up in landscape mode (at 1920×1080 and 1920×1200 pixels respectively.) The center monitor is a portrait display (like a page of paper in a typewriter…Typewriter??? OK…so, I’m really OLD. Ha!) at 1080×1920 pixels resolution. The center monitor handles a full-page (at up to 130% size or so) for writing–even legal size, (8-1/2 x 14 inch) paper when I’m working in a residential appraisal form, for example. The monitors on the left and write handle research, references, music, multiple browser windows and tabs, directory windows for my Google Drive, SkyDrive, and DropBox folders…etc etc. A $150 Nvidia PCI video card (got it on Amazon) with one HDMI port and two digital ports–the white or black colored video cable connectors (the older, blue video cable connectors are VGA?) connects all three monitors to the back of my old i7-CPU, DELL desktop. I run Windows 7 Pro. Pretty sweet system. Very productive. Cheers. I believe the Mac version of Scrivener has a track changes feature (Format > Revisions? ), but yes, it would be really useful to have that feature in the Windows version as well. How do you go about working with a proofreader? 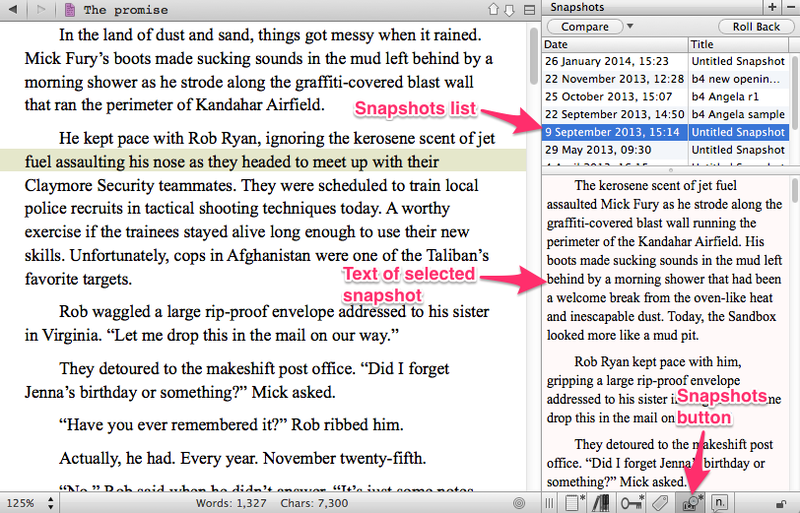 Do you copy and past what they proofread back into scrivener? Scrivener really needs a track changes option.